14 pics. 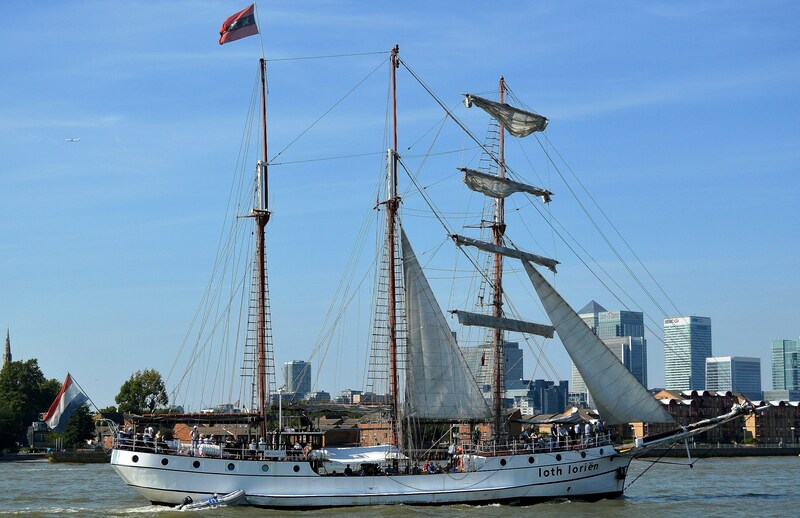 The Festival brought a group of tall ships up the Thames for the first time in 25 years. 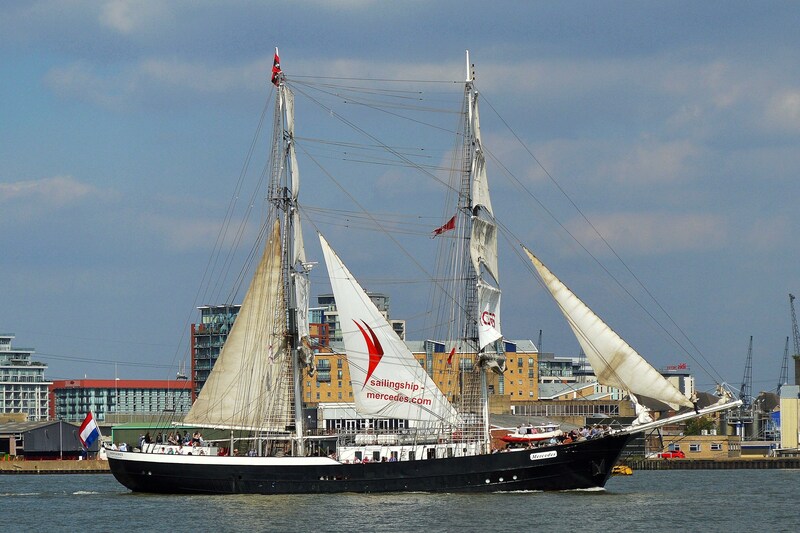 They met from all over the world at Falmouth and raced to Greenwich. 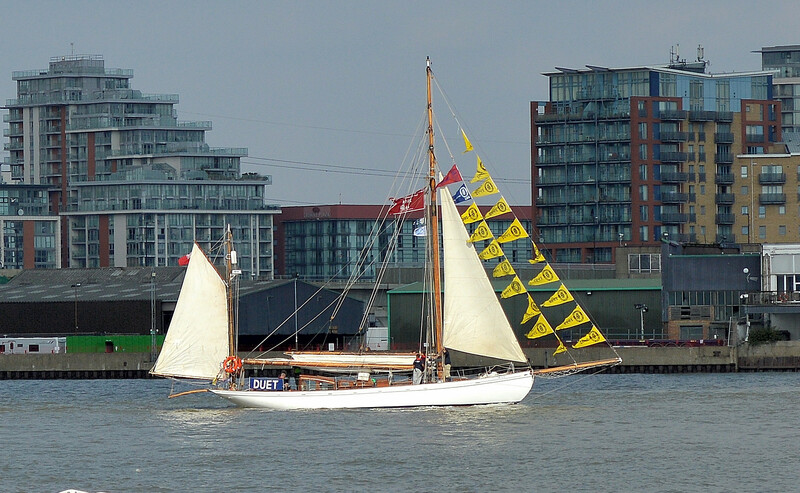 During the last day parade the wind was not favourable to sail. Hats off to the skippers for making sail for the spectators, even though it meant expending extra fuel to make progress. There were 50+ taking part. Here are a few. 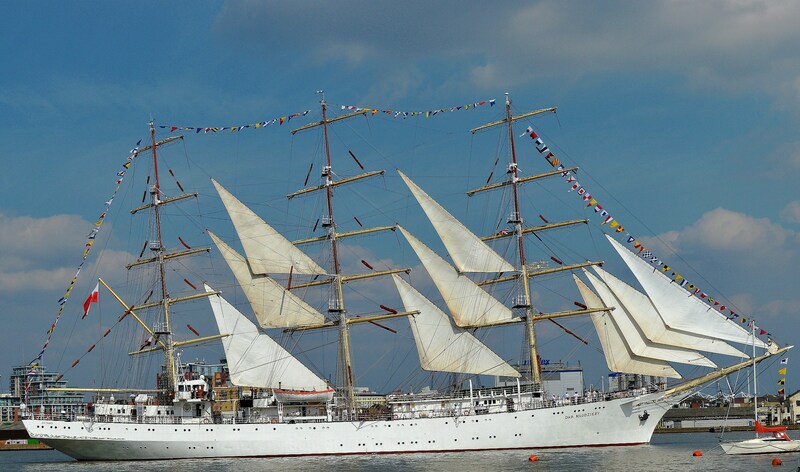 Dar Mlodziezy, which dwarfed all the other vessels, won the first in it’s class (A). Duet won first in it’s class (B) and first overall. 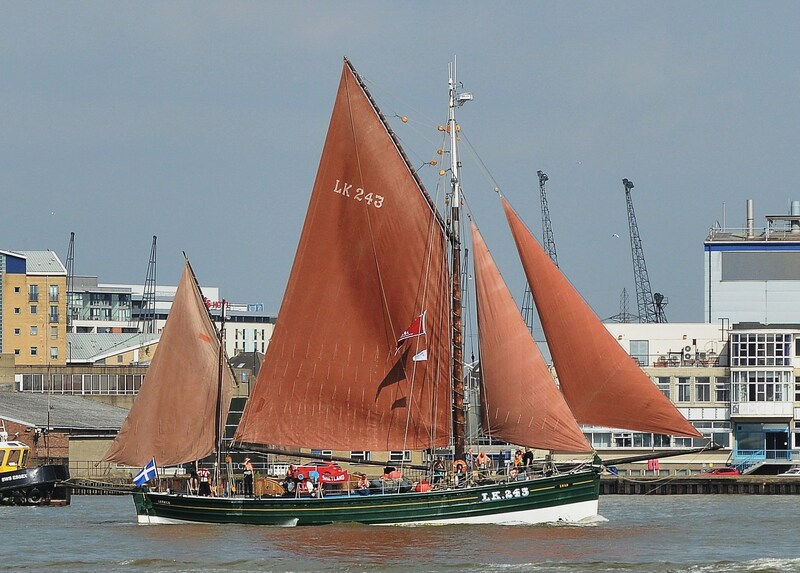 It is a yawl. 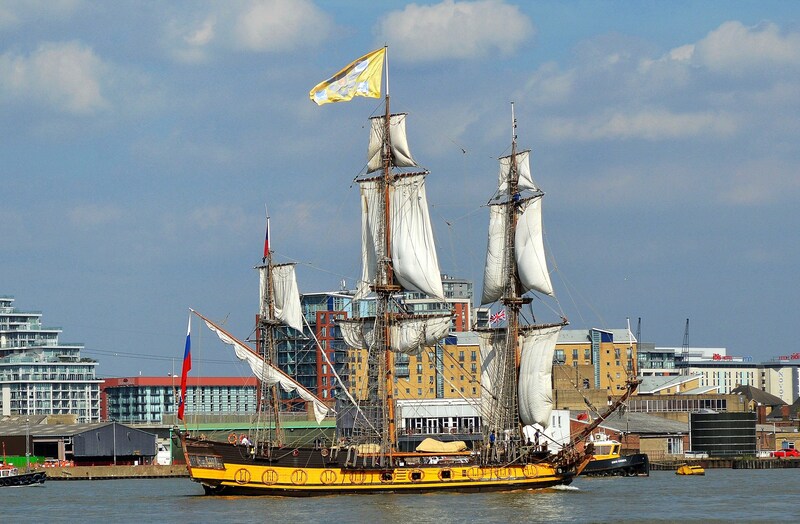 That is, it has an additional mast/sail aft of it’s rudder. The design was originally created to add extra sail without breaking the design rules for it’s racing class. 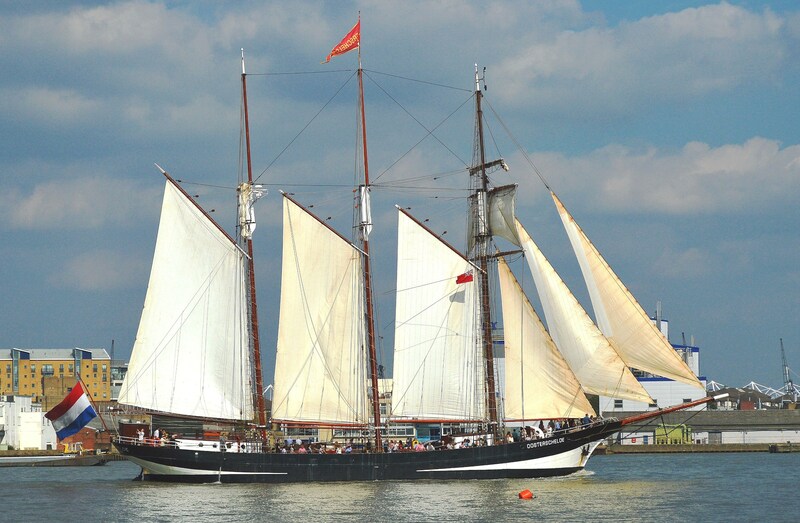 That, together with a big mainsail and two additional foresail(s) on it’s bowsprit, makes a very powerful rig that takes skill to handle well. The Cirdan Trust ⇒. Pictures under sail (updated) ⇒. 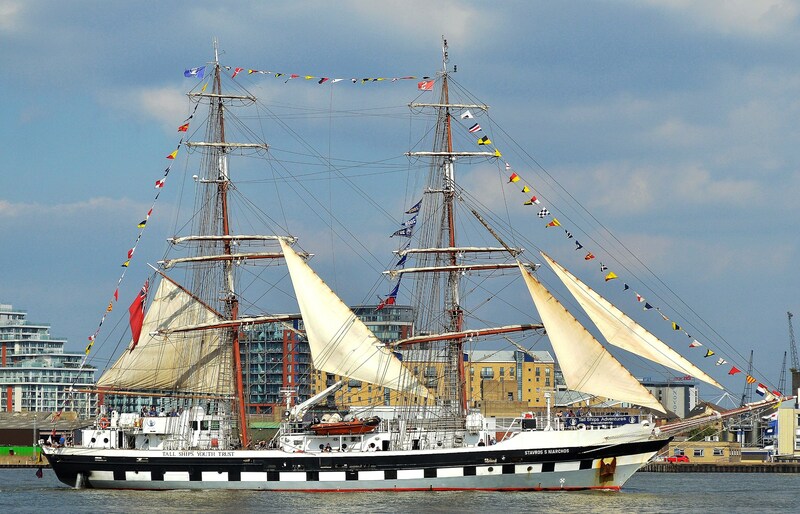 The Stavros S Niarchos won the communications prize for doing the most to aid the race schedule communications. 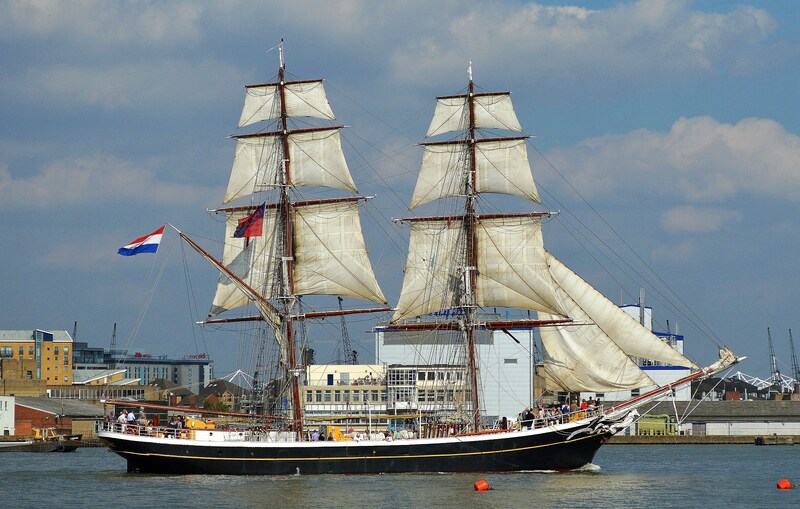 The Golden Leeuw won the the Friendship Trophy for having contributed the most towards international friendship and understanding. They were also the most international crew and won the Young Trainee Award. I couldn’t get the name of this one but it certainly caught everybody’s attention. Most particularly because it had a working cannon which they delighted in using, making everybody jump and producing great clouds of smoke. They even had the cheek to fire it in the vicinity of Woolwich Arsenal. In past days they would have been blown to bits. 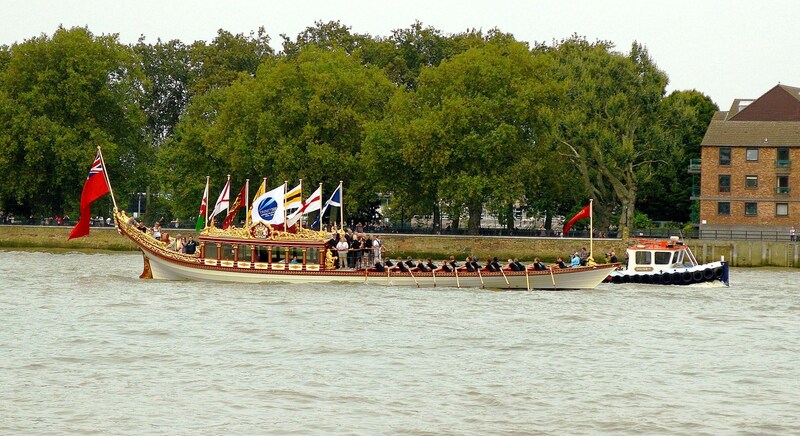 The Royal Barge appeared two days earlier and is the one used for the Queens Jubilee. Sixty years in the same job and they didn’t even give her one with an engine. A close look at the those on the oars would indicate that they have probably been quaffing something. Next, click on – The Festival and it’s characters. And, thank you for visiting. This entry was posted on September 29, 2014 by Graham in Hats. 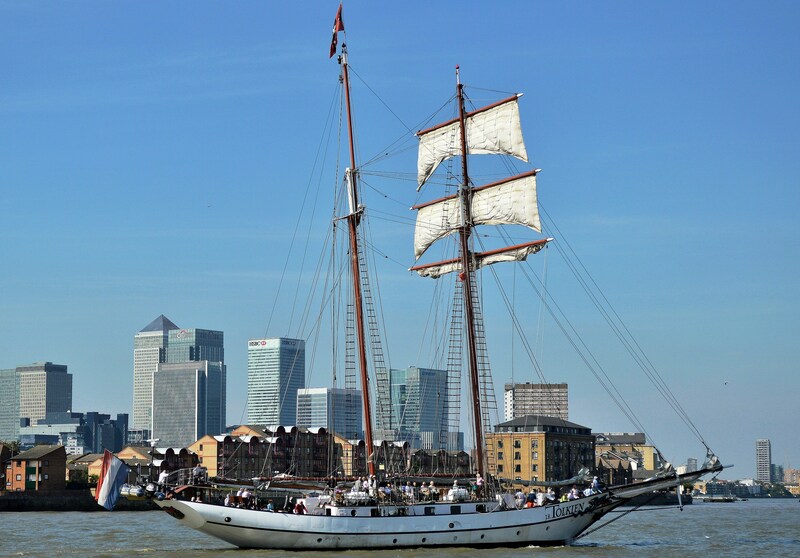 It was filed under East London, History, Photography, Travel, uk and was tagged with Greenwich, greenwich festival, history, london, photography, sailing, square rigged, tall ships, thames. These ships are incredible! 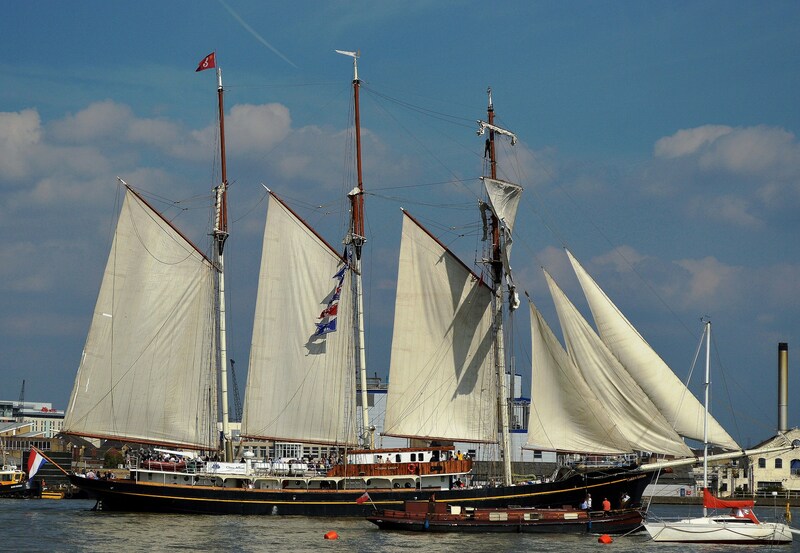 That first one nearly takes my breath away – and I get to see tallships sail on our bays with some frequency! Well captured! Thank you. And, what an adventure for those on board. I’ve had the opportunity to sail several more modern yachts but nothing like that. (if you know what I’m doing still awake at this time of night, please tell me as I haven’t a clue ❓ ). I suppose it is quite late over there. I think you must be awaiting the sunrise. Perhaps some warm milk and a boring book? Thank You showing these. 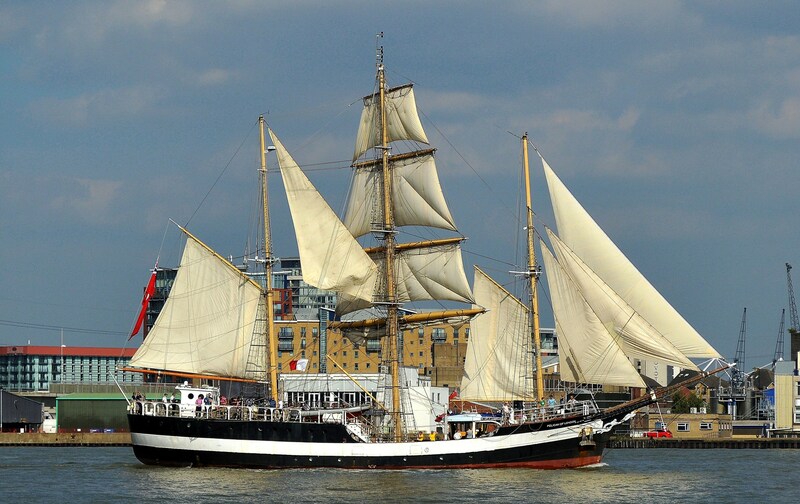 Excellent photos and so beautiful Tall ships. 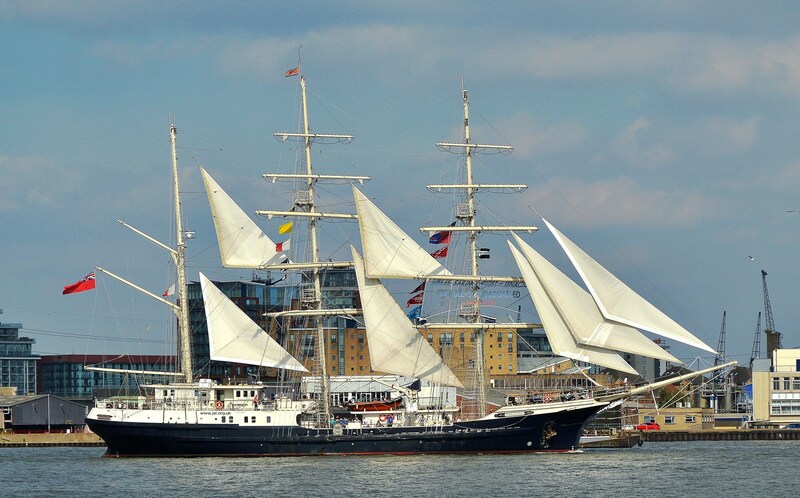 Gulden Leeuw has visited Finland many times. I think that Swan sailing yatch belongs to Swan family of luxury boats which are made in Finland by Nautor. In this post I have photos from it day before it left Finland.